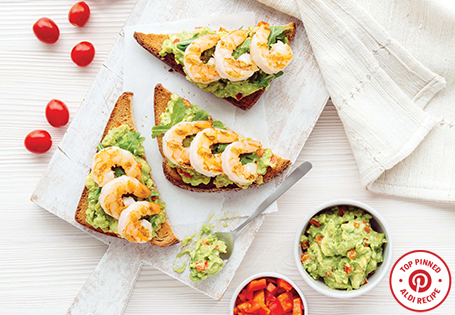 Open-faced sandwich with a choice of bacon, egg, tomato and green onions or shrimp. In a small skillet, heat oil over low-medium heat. Add garlic, red pepper and thyme. Sauté for 5 minutes until tender. Allow to cool. Scoop the avocados into a medium bowl and mash with a fork. Add the vegetable mixture, salt, pepper and lime juice. Mix until thoroughly combined. Toast each slice of bread. Spread a fifth of the avocado spread onto each slice. Top with ¼ cup arugula followed by your choice of toppings.